Last week, I wrote a post about my profound discomfort with the pervasive use of the word 'Retarded'. I told the story of how I had somewhat awkwardly - yet apparently successfully - asked a colleague to consider removing the word from his lexicon. I wrote that I had used the words of my nine year-old daughter to explain to him why I found its casual use objectionable. I began that post by quoting Tim Shriver. In talking about the R word, he had once said, "But for our part, we are trying to awaken the world to the need for a new civil rights movement — of the heart." And we are, aren't we? Day in and day out we are fighting for our children's most basic rights. We are fighting in our schools and our churches - in our communities and sometimes even in our own homes. We are fighting for appropriate education, access, recognition, opportunity, dignity. Today we celebrate the life of a man who waged war against the brutality of socially acceptable bigotry. A man who refused to be daunted by the overwhelming task of challenging a deeply entrenched system - a system that institutionalized the denial of basic human dignity and respect to an entire race of human beings. A system that legitimized the idea that any group of people could somehow be deemed of lesser value than another. Martin Luther King Jr changed our world. He empowered the disenfranchised to stand up and say, "No more." He educated those who had the power to change the order of things - to create opportunity for those who had been denied access to it before, to engender compassion in the hearts of their contemporaries and to find common ground among people who might have seemed to have had none. He created an army of advocates who saw that their true freedom would not come until ALL were free. Martin Luther King Jr did not wage his war with weapons. He did not look to destroy, but to create. He worked not to tear down, but to educate. He sought not retribution, but justice. He spoke in unvarnished truths and in so doing, he opened eyes and hearts to the horrors of racial inequality. He held a mirror to the nation and showed her the undeniable consequences of oppression. He brought light to darkness and hope to hopelessness. Dr King famously dreamed of a world in which his children would be judged not by the color of their skin, but by the content of the character within. "Whatever affects one directly," he said "affects all indirectly. I can never be what I ought to be until you are what you ought to be. This is the interrelated structure of reality." Despite his life's tragic end, his legacy endures as we strive toward the ideal of a society that truly values ALL of its members equally - affording each the opportunity to grow to his fullest potential, to contribute in her own unique way - to feel seen, understood, included and valued. It is incumbent upon us - each and every one of us - to carry Dr King's message forward and to ensure that his dream is fully and unconditionally realized. It is up to us to speak our own unvarnished truths, to educate those who have the power to effect change, to enlist our own army of advocates, to build bridges and pave their roads with compassion and understanding. It is up to US to create a world in which OUR children are not judged by their litany of challenges but by the depth of their humanity. It is up to us to show our society - as he did - that none are free until all are free. "It is up to US to create a world in which OUR children are not judged by their litany of challenges but by the depth of their humanity" - powerful words and very true. We need to lead by example. Just like you did with your co-worker. thank you. So beautifully and powerfuuly written. Thank you. "But for our part, we are trying to awaken the world to the need for a new civil rights movement — of the heart." My friend hosted Tim Shriver for dinner recently! It doesn't get much better than that! 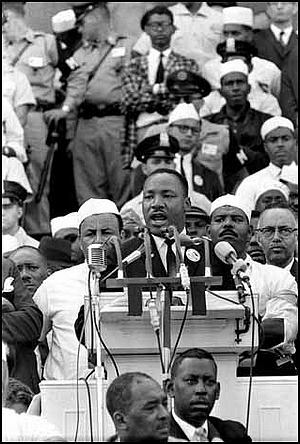 "Today we celebrate the life of a man who waged war against the brutality of socially acceptable bigotry. A man who refused to be daunted by the overwhelming task of challenging a deeply entrenched system - a system that institutionalized the denial of basic human dignity and respect to an entire race of human beings. A system that legitimized the idea that any group of people could somehow be deemed of lesser value than another." Today we are waging the same war - we are fighting a deeply entrenched system where our children are being denied basic human dignity and are deemed of lesser value. Something is happening to damage our children and those who are actively trying to figure it out are being "assassinated" in some way from getting to the truth. History sure does repeat itself. We can not afford to ignore the lessons. Our humanity depends upon it. What a terrific tie-in -- and so beautifully written. Unfortunately people can be very cynical and jealous. I'm sure you worked hard at your career. Autism touches all and we should not discriminate based on net worth. Keep up the good work!! You have helped me this year with coming to terms with my youngest having Asperger's. I wish support like you give was around ten years ago when my middle son was diagnosed with autism.